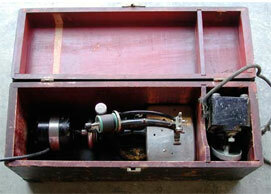 This Wilcox and Gibbs treadle machine carries a patent date of 1857. We found this machine in Perry, NY at one of our favorite collectible stores. 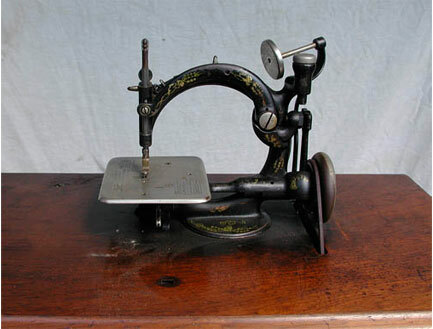 In 1856 James Gibbs obtained a patent for a sewing machine that would produce a chain stitch. 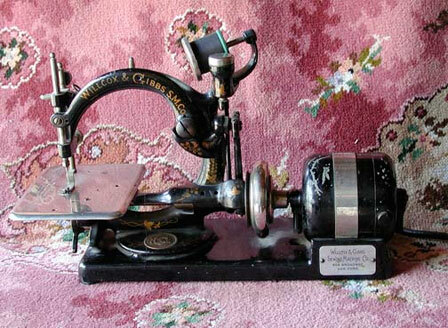 This machine has no bobbin and therefore, makes a chain stitch. Lockstitch machines gained popularity over the chain stitch machines because the stitching doesn't unravel as easily. 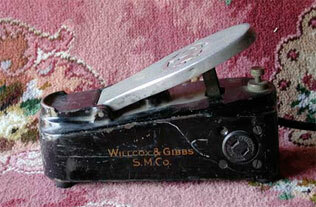 We also have a Wilcox & Gibbs with an electric motor connected direct-drive to the handwheel. Jim found this machine in Point Pleasant while on vacation. He thought about buying it, decided not to since he was flying back to Utah, changed his mind and made a call back to his sister, asking her to please go to town and buy the machine. 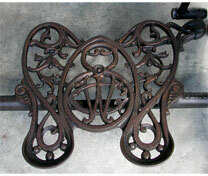 The ornate footrest is typical of the early treadle machines. In the center monogram can be seen the company initials WG (Wilcox & Gibbs). The foot pedal is a real work of art and considerably more beefy than current foot pedals. This is the carrying case that the machine can be carried and stored in. We feel fortunate to have the box. These machines date from 1915.